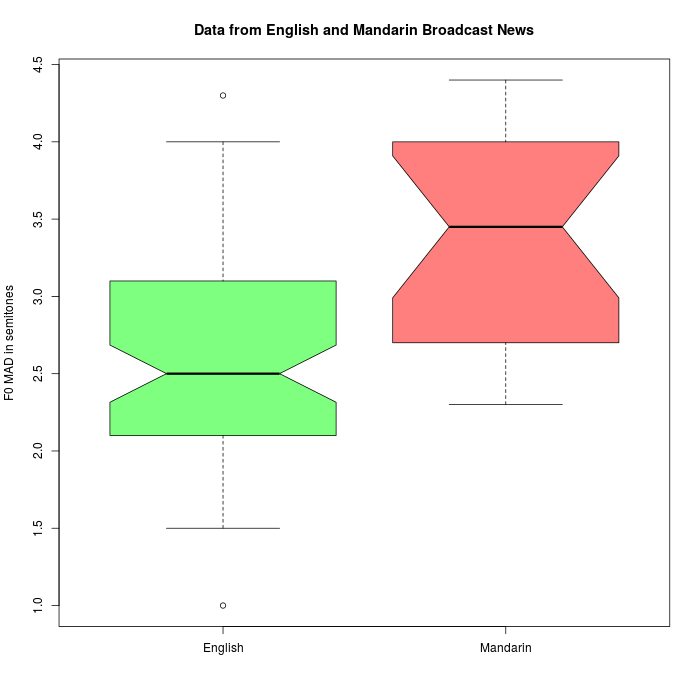 Language Log » Debate quantification: How MAD did he get? Debate quantification: How MAD did he get? 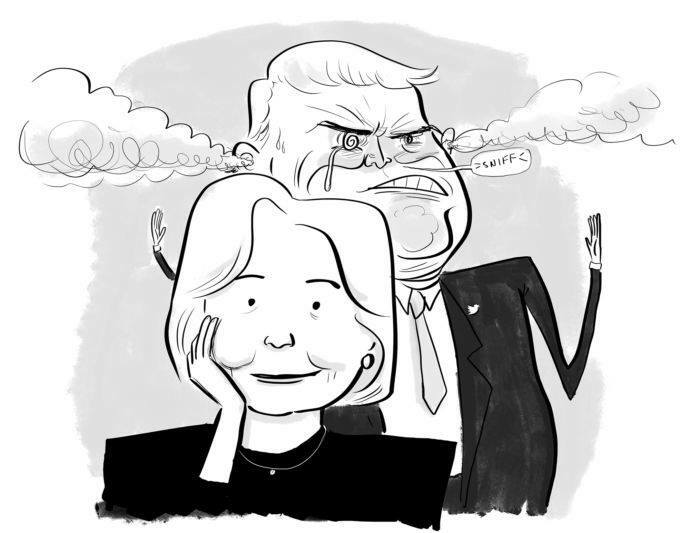 During the last presidential debate Donald Trump started off speaking in a deliberate and controlled manner that soon gave way to his usual animated style. In an informal exchange, Cynthia McLemore observed that he was manipulating his pitch range, as he did in the second debate as well — beginning with a narrow range that dramatically widened as the debate progressed. This post is an attempt to quantify that pitch range variation with a metric Neville Ryant and I have found useful in other work. 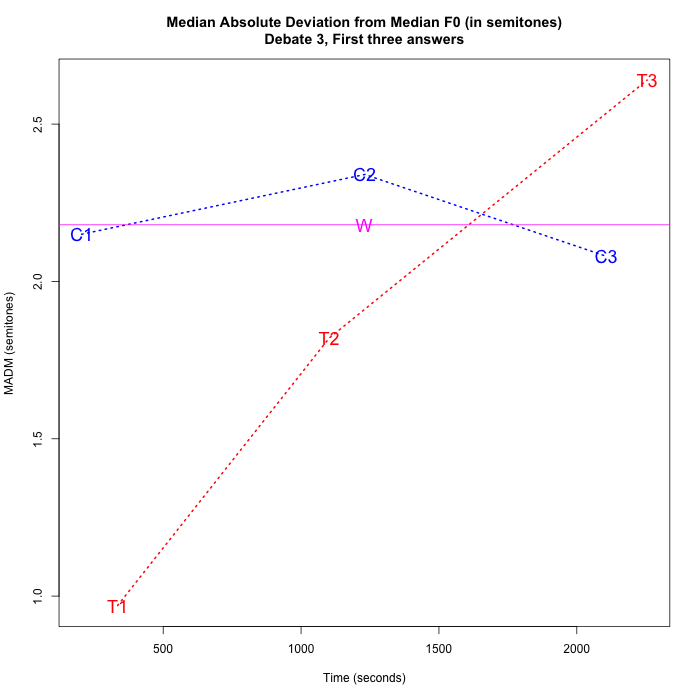 Then I transformed the f0 estimates into differences in semitones from the median value for each answer, and took the median of the absolute value of those differences. This measure of variability — commonly called MAD, for "Median Absolute Deviation from the median" — is often used to avoid excessive influence of outliers, and therefore seems appropriate for dealing with f0, where octave errors and other scattered points are problematic for measures such as standard deviation. So it's true — Clinton remains fairly level, at about the same MAD value as Wallace, but Trump starts out much more monotone, and ends up more prosodically animated. Trump's median f0 values also increased (from 112 to 144 Hz), as did his pitch range measured as the 90th percentile minus 10th percentile f0 values, which increase from 26.6 Hz to 83.3 Hz). But Donald Trump didn't become increasingly Chinese-speaking or increasingly ASD-like during the first three questions in the 10/19 debate. And the background noise level didn't change, nor did his distance from the audience. So an explanation in terms of increased emotional arousal is a plausible one. Trump's non-verbal behavior also differed markedly from Clinton's. He squints much more, whereas she keeps her eyes open wider. He purses his lips and shakes his head more than she does. Also I noticed that as the debate progressed, he tended to move his torso around more than she did and leaned on the podium while she stood up straighter. "Paper cut to the heart"
2) MAD = Median Absolute Deviation from the median"
The ASD results are interesting. I think most laypeople (myself included) would have guessed exactly the opposite (perhaps influenced by Dustin Hoffman's monotone in Rain Man). Cashin, Andrew, and Philip Barker. "The triad of impairment in autism revisited." Journal of Child and Adolescent Psychiatric Nursing 22, no. 4 (2009): 189-193: "Many people with autism have a monotone quality to speech." Stokstad, Erik. "New hints into the biological basis of autism." Science 294, no. 5540 (2001): 34-37: "Autism is associated with language problems, and those who speak largely do so in a monotone." Tager-Flusberg, Helen. "On the nature of linguistic functioning in early infantile autism." Journal of autism and developmental disorders 11, no. 1 (1981): 45-56: "Clinical reports note that autistic children have peculiar voice quality and sometimes speak in a monotone." Adamson, Lauren B., Maryann Romski, and Andrea Barton-Hulsey. "Early language acquisition in autism spectrum disorders: A developmental view." In Comprehensive guide to autism, pp. 1061-1080. 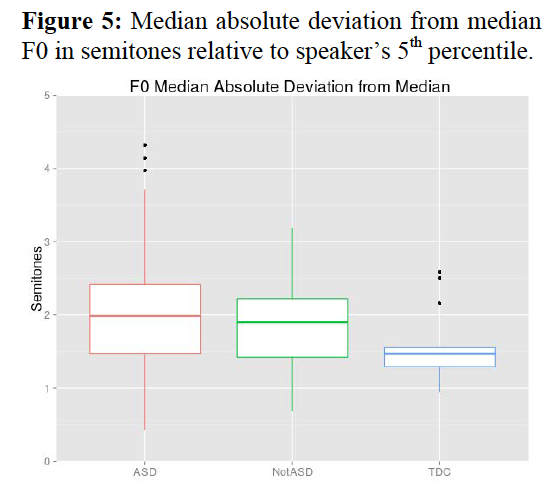 Springer New York, 2014: "Moreover, several of the phenomena associated with autism, such as echolalia and singsong intonation, are not unique to ASD"
I'd like to see a ranking of the median absolute deviation from median F0 of the outgoing House of Representatives. It would be fascinating to see how that breaks down by party, gender, voting record on immigration, and body mass index.